Mayport, Florida, part of Jacksonville, is a small fishing community in northeast Florida, bordered on one side by the Saint John's River and on the other by a military base. The village was founded more than a hundred years ago "by fishermen and cats," and "cats have outnumbered residents by at least three to one" for most of that time, according to Tammy King, local resident and head of the village TNR (trap/neuter/return) program. The area is perfect for cats, she says, with plenty of hiding places in the wooded areas and marshes that make up the geographical terrain. In addition, most of the homes of the approximately 80 residents were built above ground, with crawlspaces beneath the houses where the cats can hide during the day. In fact, so many people regard Mayport as a cat paradise, that the village is a frequent dumping ground for unwanted pets, including those of military personnel who often leave their cats behind when they are transferred from the area. With only two routes in and out of Mayport - a ferry and a two-lane bridge - once the cats arrive, they are generally there to stay. "After many years of allowing the cats to breed at will," King explained, "the population exploded and disease began to spread." With only one access road into and through Mayport, a second major cause of death was being hit by cars speeding through the village. By March of 2007, after reading The Cats of Kittyville, King was inspired and ready to take action. "I said to myself, "Here is what I want for me and what I want for Mayport," she recalls. Her own vet charged more for sterilization than many people could afford, so she talked to the Jacksonville First Coast No More Homeless Pets (FCNMHP) clinic about the possibility of using their spay/neuter services. "As long as we trapped [the cats] and transported them to and from the clinic," she said, "all the cats in Mayport could be spayed/neutered for free thanks to a grant they had been awarded." 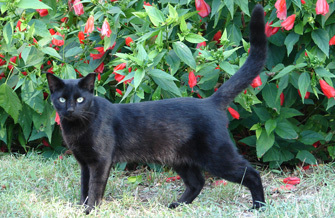 Between 2007 and 2009 a concerted effort on the part of King and other village residents to TNR their cat population was successful in stabilizing the population growth. Today in Mayport, there are no more kittens being born to existing colony members, the death rate from illness and speeding cars has dropped, and there are 14 smaller established colonies instead of the previous nine large ones. King describes the effort as, "four years of trial and error and the work and dedication and just late nights." King manages three of the colonies herself, with the rest maintained by other residents. "I put in at least 30 hours a week [taking care of the cats] in addition to my day job," she said. "At first I just started doing it for the cats. Then I started seeing the people I was working with, and I felt like they needed help too along with the cats." The effort has brought the community closer together, with an added benefit that the colonies are now cleaner, neater, and safer areas for cats to live. "Helping people to help the cats makes a big difference. When we return healthy cats to the cat colonies, people return the favor by keeping the cat areas clean and healthy." King adds, "Neighbors will help each other with caring for the cats, and there is more socialization between the residents for the sake of the cats." She noted that cat food is distributed to those in need who are caring for colonies. King identified the key to success for the program is maintenance and community education. 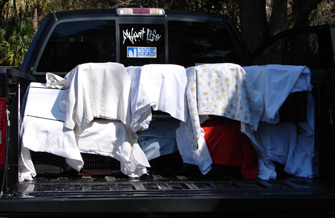 "Nothing else works as well as TNR! It"s phenomenal and amazing what it"s done for Mayport." With all the success of the initial TNR project has come an increased need for expanding services to surrounding areas. "As we get better known, more people are calling us about injured cats, and we are spending a lot more time transporting cats to FCNMHP," King says. 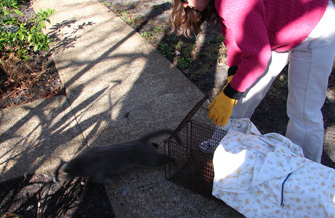 On the day we spoke, she had one cat with her on its way back from the clinic after having had stitches. Recently, she transported cats whose injuries and illnesses ranged from a dog attack to a facial infection to infections requiring removal of an eye. Another cat was found abandoned with his collar imbedded in his skin where it had been wrapped around his arm. The serious nature of these injuries and illnesses and the unusually cold winter in Florida this year have meant that the cats need a longer recovery period. "What we need now," King said, "is a recovery facility for the cats." She has frequently used her home for that purpose but doesn't have the space for more than one cat or cat family at a time. For the last four weeks a momma cat and her newborn babies have been the sole residents. "We have the land for a new building. The problem is getting the facility built." King and the community TNR group is hoping that a building or building materials will be donated. In the meantime they are in the process of creating a fundraising campaign. She added that a cruise ship terminal is going to be built in Mayport, which has the potential to become a great collection point for donations. Local festivals and gatherings are another avenue. "Everyone in Mayport knows the problem, but most people don't have the money to help. They help as much as they can." King acknowledges that people's attitudes toward feral cats are changing. "For so long these cats were ignored and people didn't care. Now people are now coming to me, going, "Hey, I've got this cat. Can you help?" That's what keeps me going." Donate funds to Mayport Cats, Inc. to help the felines. Mayport Cats is one of the Best Friends Network partners.